A dazzling canopy of colour is coming to greet shoppers, locals and tourists in Larne town centre. 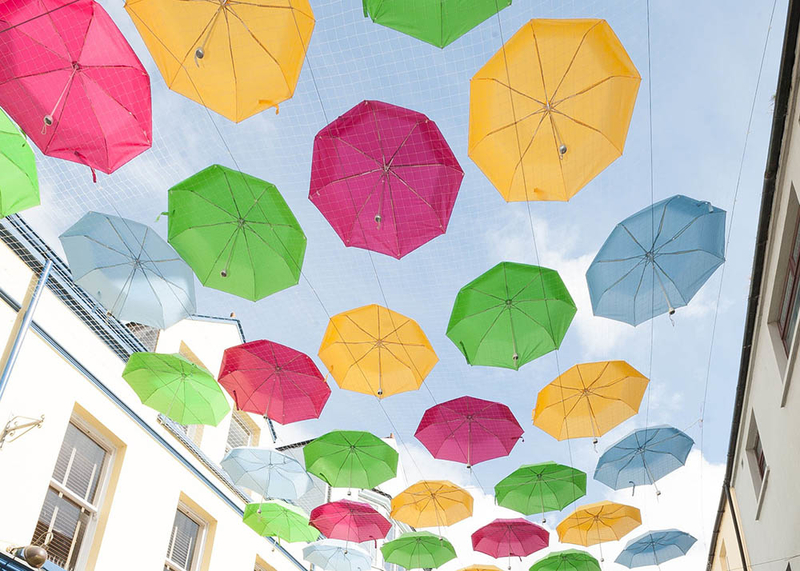 A number of colourful umbrellas will float above Lower Cross Street and Dunluce Street in a spectacular display of urban art. This project is supported the European Union’s PEACE IV ST.ART Programme, managed by the Special EU Programmes Body (SEUPB). ST.ART (Street Art) is a cross community, intergenerational project that works with communities to bring life into underused spaces, harnessing community spirit and pride to create open welcoming events. The launch of ‘Umbrella Street’ on 29 March will kick off the Larne Spring Festival, a 6 week programme of events, running in association with Larne Traders Forum and Larne Renovation Generation. It will see outdoor music and entertainment, a pop-up cinema, outdoor cafes and family entertainment in the town centre until May 2019. There will also be a special preview concert on 30 March in Broadway to give Friends Goodwill Music Festival goers a taste of the fantastic acts to come as that gets underway on 11 and 12 May. Following the increase in footfall to West Street in Carrickfergus after the umbrellas were installed there, it is hoped it will have a similar impact in Larne. Chair of the Economic Growth and Tourism Committee, Alderman Gregg McKeen, said: “This stunning installation will encourage a new spout of optimism, adding a vibrant splash of colour to our wonderful town of Larne. It will be a real talking point, and like Carrickfergus I am very hopeful that it will be received well by everyone who visits the town. For more information and to keep up to date you can go to the Larne Spring Festival page.